"A new twist on meatloaf. You can even try it with ground turkey. The sausage gives it a little oomph!" In a large bowl, combine the ground beef, sausage, bread crumbs, onion, mushrooms, soup and egg. Mix together well and place in a 5x9 inch loaf pan. Bake at 375 degrees F (190 degrees C) for 50 minutes. Gramdma knows what she is doing, for this is an excellent recipe, particularly if you add a little more of your favourite seasonings. I used all ground beef instead of the sausage and about a quarter of an onion. I topped it with ketchup and it was delicious. 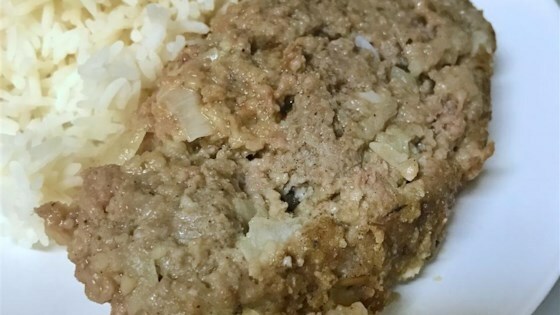 I used this recipe with turkey, not beef, and it tasted very flavorfull and moist. But it took about a half an hour longer than the recipe required in baking time. love it in steelers country. I cooked this for a half hour over the cooking time and it was still not cooked. It didn't even hold shape. I think the flavor would have been good if it would have cooked properly. GREAT RECIPE!! I have been looking for a moist recipe and I found it!! The family loved it!! I made it with a meatloaf meat mixture from the store and hamburger. FANTASTIC!! SINCE IM A "PEPPER HEAD" I ADDED TWO TABLE SPOONS SEEDED AND MINCED FRESH JALEPENO PEPPER TO THE MIXTURE. LIKE EMERIL LAGASSE SAY'S "KICKIN IT UP A KNOTCH".